Masters of Cinema bring us #185 in their series of remastered masterpieces. This time it is writer/director King Hu‘s (The Swordsman, A Touch of Zen) epic Legend of the Mountain, an ancient tale of good versus evil in the form of humans trying to survive against the spirit world. 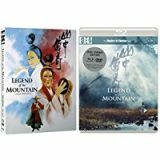 Legend of the Mountain has been fully restored for the first time to it’s original 191 minutes long and you are in for a visual treat of the Korean landscapes (even though this is a Taiwanese story) and vistas as well as the ghostly story. Set in the mists of the eleventh century where China is feudal and a young scholar is trying to make money as a a copier of texts. He gets a letter from a monastery that a Sutra needs transcribing, so he sets off across the beautiful countryside to the Gaya Mountain to find the Ocean Mudra Temple, a Buddhist retreat. Our scholar He Qingyun (Chun Shih, Dragon Inn) however is not a believer in spirits like the Buddhists, but a job is a job. When he arrives at the monastery he is taken to Master Fayuan who has spent the last ten years translating the Sutra. Qingyun takes the volumes, now he needs a quiet sanctuary to do the long job of transcribing them. One of the other monks knows of a place further north and he gives him a letter of introduction to General Han. So Qingyun sets off with the tools of his trade and the Sutra on his back and starts the long journey North. Along the way he spots that he is being shadowed by a monk and he starts seeing movement in the shadows. He continues on and begins to believe in spirits as he hears flute music and spots a young woman playing it, but every time he tries to see her properly she vanishes into the mist. Eventually he arrives at a walled village where General Han is posted and he he is promptly attack by a mad man in rags. A man on the wall shouts for Zhang (Feng Tien, Five Fingers of Death) to stop, he does so reluctantly and Qingyun is relieved to finally see a sane person and he explains that he is looking for General Han. He discovers that Han died a while ago defending the country but he was his adviser Mr Tsui (Lin Tung, Snake and Crane Arts of Shaolin). Qingyun shows him the letter and Tsui shows him the Generals mansion and invites him to stay and carry out his mission in peace, but that is soon shattered by the prying housekeeper Madam Wang (Rainbow Hsu, The Warlord) and her talented daughter Melody (Feng Hsu, Golden Arhan) who ply him with wine which he is not used to drinking and when Melody starts playing her drum he is hypnotised. He drinks far too much and passes out. The next morning everything has changed for him as Melody is getting dressed in the next room. He doesn’t remember anything and she tells him that he had confessed his love for her and that they had got engaged and had slept together. This is all a shock to Qingyun but he will stand by his betrothal. We as the viewer can tell all is not what it seems with Melody and her mother as they know about the Sutra. Now we have the battle between good verses demons to get control of the spirits of the dead as they battle with drums and cymbals and different coloured smoke, ace stuff. This is an epic film but well worth the experience of an ancient ghost story.